I have thought long and hard about how I want to share this news. I am sure most of you have figured it out, but just to be safe, let's start at the beginning. Two years ago, this happened. Excitement. Eagerness. Purpose. Something to look forward to, to write (call) home about, something I could be good at. Then somewhere along the way, this happened. Frustration. Burn out. Wasting time. Wasting days. Wishing I were 1,000 other places. And most importantly - I knew I was ignoring this. Denying what I knew I was designed to care about, to love and to do. I live in Music City, damnit. I grew up on country music. I love it. And I still love it for a reason. I know I have that passion for a specific purpose. I also know I will spend the rest of my life kicking myself if I don't invest my time, my energy and my skills, working for music, the thing that I love, when I am more surrounded by it than I'll probably ever be. Because life is too short to settle. Especially when you're settling 7.5 hours of your day away, everyday. So four days before I finished this goal, I set a new one. I entered my resumé into a pool of 375 applicants for what I started calling a long shot and my dream job. Three interviews, three months and countless hours of worry later, I just did this. One floor above the Black that the Man wore, and his guitar. One floor above original, handwritten lyrics to some of the most famous country songs ever written. One floor above some of the guitars and pianos that legendary artists used to play legendary songs at legendary venues all over the world. One floor above some of the most recognizable costumes, cars and hats that were ever owned or photographed. One floor above a collection of silver, gold and platinum records for songs that made country music into a national phenomenon. 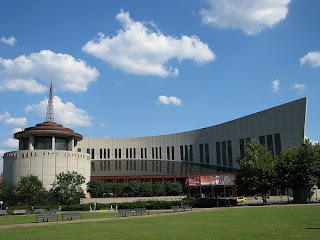 In the same building where the history of country music is collected, preserved and displayed. In the same building where a league of artists are honored for shaping the music industry and accomplishing goals that most of us could only dream about. Some of you may be thinking, so what? Maybe not all of you get it. But here's the thing - I DO. I get it. I understand it. I appreciate it. I have the passion for it. And starting July 21 (exactly three months after I submitted my resume), I get to surround myself in it day after day after day. So, goodbye advertising and public relations. YAAAAAAAAAAAAAAAAAAAAY, Lindsay!! We are so proud! wooooooooooooooooooooooo. I've seriously been checking your blog all day waiting on this post to come up. So proud of you. Maybe I'll buy you a celebratory bottle of wine. You did it. Yeah, Linds! I'm doing your jazz box step slide in my office celebrating for you. Now throw yo hands up in the sky-hyyy. You might get on CMT momma, you might be sittin in baaaack. Congratulations! This is amazing, and so encouraging, especially for someone looking for her own evasive dream job. I can't wait to read about your new job! wahoo!!! i like wes, have been waiting for the offical post and full story! so excited for you...and totally expecting lots of cool autographed things. lets make a deal. everyone you get an autograph from, you gotta get me one too, k? cool. thx. p.s....i clicked on every link in your post, then it wouldnt let me back so i had to close out then go again. no worries, your faithful blog stalker perservered!!! So glad to finally know what the "light at the end of the tunnel" picture was all about! I have checked your blog about 20 times today waiting to see what Monday had to bring. So excited for you!! Congrats!!! What fun and exciting news! It was definitely worth the blog wait. Now tell us what your new title is and what you'll be doing! girl...i am so proud. i've almost finished my bottle of wine i've been working on since you gave me the news. sista, you rock! As someone else who thrives on and owes their happiness to music, I'm so happy for you. People think: I want a high paying job so that I can enjoy my life. What they don't realize is that when you spend eight hours a day at a job, it is your life. We owe it to ourselves to pursue a job in which we will be ultimately happy. A job in which we will daily find hapiness, success, and contentment. This will make the rest of your "life" (the things you do when you're not working) even better because you aren't having to release the steam of the horrible work day you just had. I say all that to say, congratulations. You deserve it. That's awesome. woo hoo! I am so thrilled for you, and also glad the cat's out of the bag. love you. Congratulations! It will be so exciting to do something you love! I don't think I could have handled much more of the dangling bait... it was time for the scoop! Way to go LJ! I'm so happy for you and can't wait to hear more about it. FYI...I just posted for a position with GE in Nashville... ill let you know when I come up to interview.